Another day another policy group report. This morning the National and International Security Policy Group unveiled its final report at Chatham House. The group's chairman, Dame Pauline Neville-Jones, was introduced by David Cameron who pointed out that he had placed her in a difficult position as she was now a member of the Shadow Cabinet to whom she was submitting a report. As well as David Cameron (who has not attended either of the two previous policy group launches) Liam Fox, William Hague and David Davis all attended. In common with the reports launched by Social Justice Policy Group and the Globalisation and Global Poverty Policy Group this morning's report - entitled An Unquiet World - is comprehensive and substantial, David Cameron called it "hard headed, gritty and practical." The growing world powers are in Asia; Britain should make more of its unique relationship with India. Power is shifting to the large producers of raw materials yet these countries are often unstable, authoritarian regimes where the resources are state owned. The ideological challenge of political Islam to liberal democracies; where Dame Pauline said we had to succeed, there can be no compromise. The report does include all the recommendations we previewed this morning but in her speech Dame Pauline focussed on an increased use of diplomacy, highlighting the importance of the special relationship and calling for greater engagement with China and India; the need to integrate rather than alienate British Muslims, saying that separation is increasing, and starts early, often when choosing primary schools; and more support for our overstretched armed forces, calling for a defence review and the creation of a dedicated force to assist with civil emergencies. Dame Pauline was critical of Gordon Brown's announcement yesterday about border police, saying that it was not comparable to the force being considered by the Conservatives. In the questions afterwards David Cameron was asked about his strategy and he was resolute, saying he would "stay in the centre ground, battle for the centre ground." The problems that have been highlighted and the recommendations in this report are fine up to a point but are fairly obvious - why so much time was needed to get to this point is beyond me. Dame Pauline Neville-Jones was interviewed on The Daily Politics, about 17 minutes into the programme. In May this year we wrote to the Leader of the Opposition with our response to Uniting the Country, the interim report produced by your National and International Security Policy Group. My letter to Mr. Cameron outlined our robust response to the accusations levelled at the MCB. Overall, the MCB viewed the Interim Report as a tremendous missed opportunity. 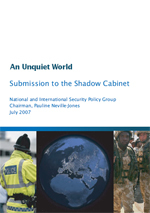 It neither addressed adequately community cohesion – the stated aim of the Report – nor did it address the safety of the realm and international stability – the remit of the Report’s authors. We concluded, however, on a note of optimism with a commitment to engage with the Conservative Party. Mr. Cameron was gracious in his reply and promised to pass on our response to your Policy Group. I enclose our correspondence. I was hoping that your Policy Group would take the opportunity to read our deliberations and engage with us in open discussion in the spirit of co-operation and in the interest of our shared goal of a cohesive, successful Britain. As you publish your final report, An Unquiet World, I am dismayed to learn that the gross misrepresentation of the MCB persists. It appears that the detailed response we provided to your interim report has been wholly ignored. Policy matters aside, An Unquiet World, is adamant on pursuing a McCarthyite track to cast aspersions on our patriotism and our commitment to an integrated British Muslim community. Despite our reservations, we still hold true to our commitment to seek the common good and extend our hand of co-operation to work together on this matter. Anything less would betray our founding values. Your report states that we are interested in lobbying rather than leading. We have demonstrated leadership, and we are interested in engaging and ensuring that all British Muslims are part and parcel of our liberal democratic traditions. In this regard I would request that we meet to discuss the outcome of your report. My team and I would like the opportunity to answer the allegations made in your Report. Beyond that, we wish to work to pursue your goal of a united, safe and prosperous Britain.